The fall leaves and bricks are a beautiful orange — and so are the rocks. RIT’s campus is decorated with a smattering of colorful, paint-encrusted rocks. Some kind of odd beautifying tactic from the Campus Aesthetics committee, perhaps? 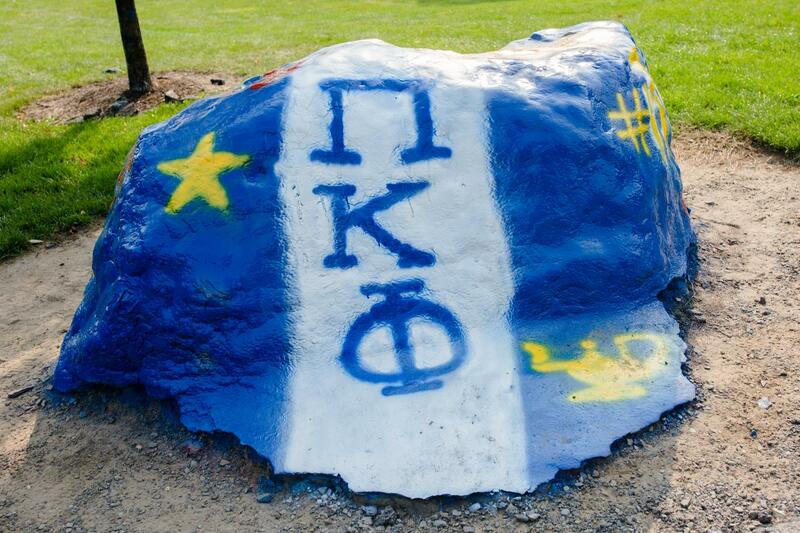 Painting the Rock is an honored custom of the campus’ Greek Life organizations that has inspired other student groups to splash some color on any little stone on campus. 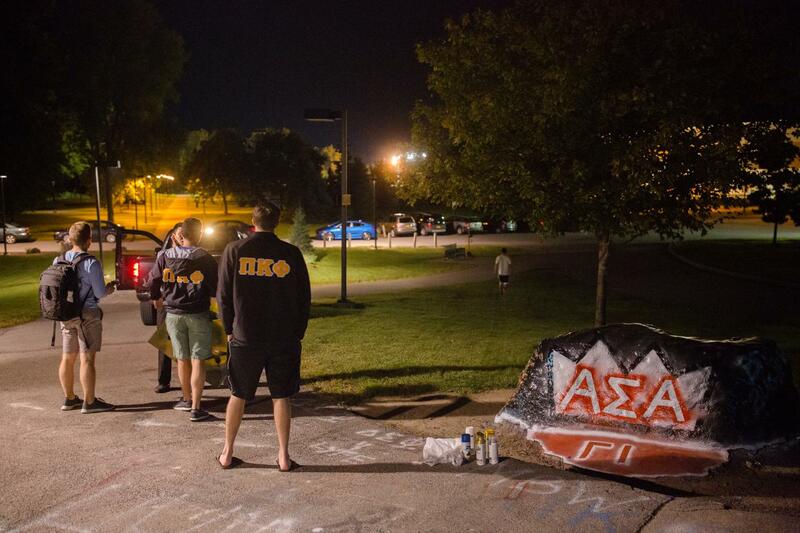 Each new pledge class must spend a night guarding the Rock and painting it in their organizations colors. There are two main rocks, one on the Greek Lawn and the other on the Quarter Mile Walkway, next to the August Center. The latter is the most competitive rock to paint. “After you paint it, you have to have one person there until morning. No one else can paint it if someone from your organization is at the rock,” said Ryan Kent, a second year Electrical Engineering major and president of the House of General Science. Kent is a solid rock-painting veteran, having completed this mission once with the House of General Science and three times with the fraternity Sigma Chi. Alpha Sigma Alpha members Casey Mazza, a third year Industrial Design major, and Taylor Baird, a third year Accounting major agreed with Kent — the rules can be a little unclear when it comes to painting the rock. There are some instances, however, where certain formalities are observed. "If the rock is ever painted as a memorial to somebody, then typically you’ll wait a good amount of time and then you’ll consult about when you can paint it, just out of respect,” explained Mazza. While there is only one rock that has rules shrouded in tradition, other rocks have been painted, either as artistic expression or an attempt at PR. Not everyone likes the colorful splotches on our otherwise dreary campus, though. In 2014, a P petition called "Too many painted rocks" made a stir on campus; a counter petition, "Not enough painted rocks," garnered more support. In response, Student Government claimed to have power-washed The Rock, erasing years of history. It turned out to be a very convincing April Fool's joke, using rock texture spray paint. Little is known about the history of painting the rock. Kent heard that it may have started in the early 2000s. Though there is no magnum carta about rock painting, other universities also have their rocks painted by students. Basically, a bunch of college kids all over America are spending all-nighters pouring paint on a lump of stone. 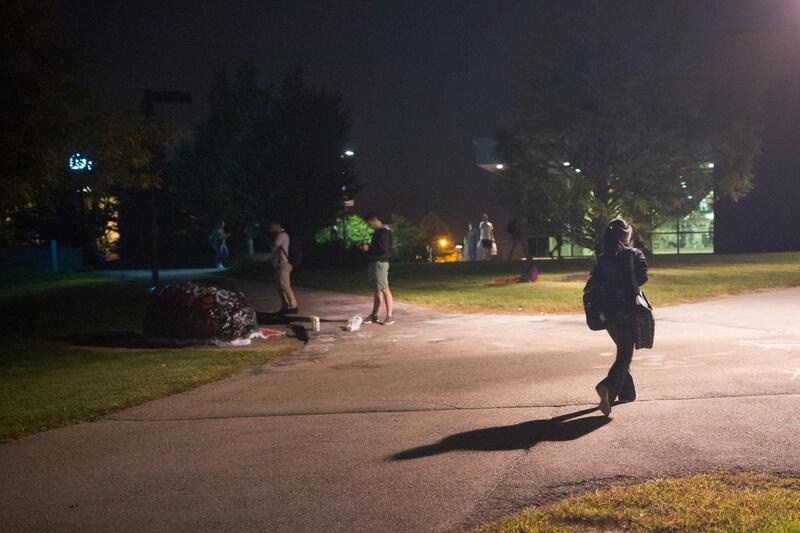 If you are ever on campus late at night, you may witness the festivities Kent refers to. Baird reported that painting the rock is also a great way to foster relations between groups as well. “When my sorority painted it, we actually shared with another fraternity. So we did it not only as a bonding experience between ourselves, but also between another organization," Baird said. "We made connections that last, and we’re still friends with a lot of those people." With 29 sanctioned Greek Life organizations, seven Special Interest Houses and a host of dedicated active clubs and Major Student Organizations on campus, getting your groups name on The Rock can be quite competitive. All this hassle for the fleeting glory of having decorated a piece of landscaping seems like a lot of effort, and it is. Will students continue to keep this tradition alive? Kent is very positive about The Rock’s future. With all of its strange quirks and ridiculous snowfalls, one quality of RIT that you can definitely count on is that people care a lot about the courses of study, projects, research, clubs and activities they choose to engage in. It’s why we have over three hundred clubs, majors so specific that parents don’t know what they are and furries having regular get-togethers on campus. People love what they do, and they came here to do it. That builds a community, the type of community that will paint a rock in the rain at one in the morning and have a blast doing it.